Three bits of very exciting news to share today! First, I am 6 hours post-op from having LASIK eye surgery! (I'm writing this at 9pm Thursday night.) I can already see such a huge improvement since the haze I was in right after the procedure. Then I took a nap and things are starting to look amazing! I cannot wait until the morning, after a good nights' sleep. This is HUGE news for KBP! I'm so excited to get behind a camera and not second-guess my focusing, not have to pause to wipe smudges from my glasses, and actually be able to hold the camera right up to my eye. So excited! Second is the announcement of my newly developed Film Photography Sessions plan, pricing, and packet. 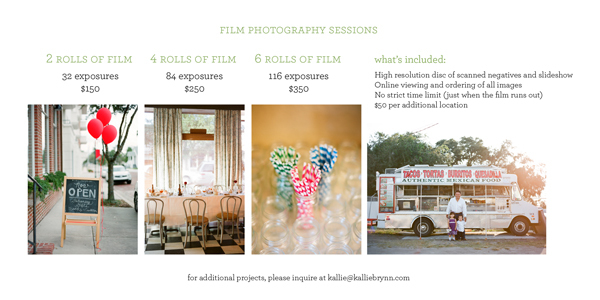 I'm excited about all of the possibilities this plan, based on number of rolls of film taken, can open up for new clients. This goes beyond engagement sessions to eateries, products, lifestyle (everyday life and love! ), pregnancy, newborn, and more! I hope you'll be so excited, you'll want to book a session (and let me flex my new eyes)! Below are pages from the packet. 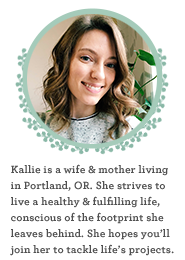 You can always email me for the Packet, and can download the pdf onto your computer here: http://www.kalliebrynn.com/KallieBrynnPhotographyExperienceSessions.pdf. 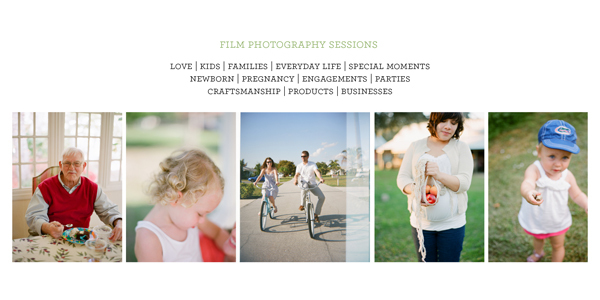 Third is an amazing feature and an example of a TWO ROLLS OF FILM session - coming in the next blog post! kallie this is all such exciting news! i'm endeavouring on a new business idea and we're hoping next year will bring a pregnancy - i can't wait to employ you!! i'm very, very excited for you. blessings on a quick and total recovery and with all of your new projects!